Stylist's editor-in-chief gathers up some of her favourite people for a Mediterranean island escape. The delights of the Rocca delle Tre Contrade villa in Sicily are so alluring it takes real will power to venture beyond its walls. The Greek island of Corfu is one of Europe's most desirable holiday destinations. Il Tabacchificio features in the top 10 best Italian villas. With its charming, rustic approach to life, Italy's southern region of Puglia is all about indulging the sense and making idleness your new ideal. 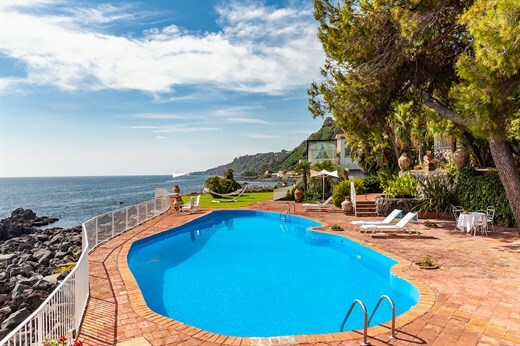 Live the good life with villa rental specialist the Thinking Traveller. Journalist Harriet Charnock-Bates stays at our villa Ortigia while discovering Taormina. Hopping between the Ionian islands, Kendall Hill discovers sleepy fishing towns, luxe villas, pristine beaches and his own piece of paradise. Sicily's cuisine, the product of a variety of foreign influences and fresh ingredients, is unique and delicious. If Italy is the world's summer crush, then Puglia is officially the one we can;t stop thinking about. 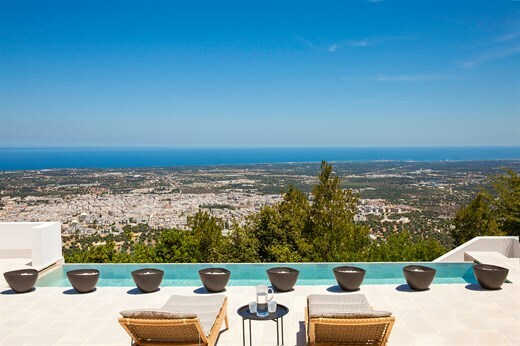 British-based The Thinking Traveller, which specialises in the Mediterranean, boast exclusive access to around 210 luxury villas and properties. At first sight, Il Tabacchificio looks like a modest stone building, low and rectangular, located at the end of a road surrounded by Mediterranean pines. Trullo Melograno, nestled in the Puglian countryside, mixes comfort with tradition to enchanting effect. A Tabacchificio hailing from the 1930's in Puglia has become the holiday home of an international family, constantly on the move. The Daily Telegraph features Villa Camilla in Puglia and Palermo as Italy's best new travel destinations. 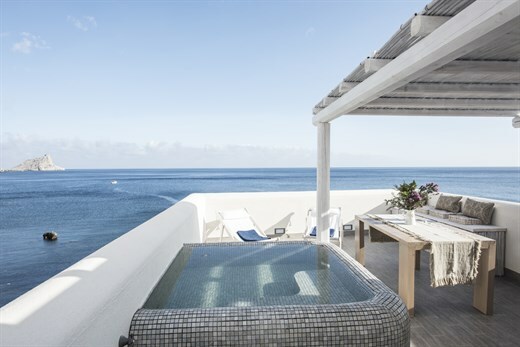 Melina feature in the top 50 hot villas with its simple but stylish furniture and its wide panoramic terrace off all three bedrooms. Modern architecture meet traditional charm at Montaltini, a modernist holiday home in Puglia. 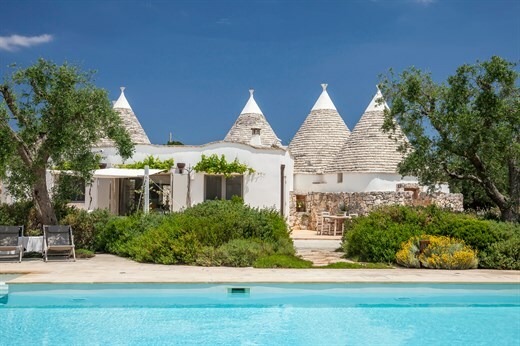 Trullo Pinnacolo features in Harper's Bazaar's list of The Best Villas, part of The Ultimate Travel Guide 2018. The Evening Standard takes a tour of Puglia, visiting Puglian towns such as Martina Franca, where writer Dipal Acharya is based for the week in Fichimori. "Beneath the big-top act of Mount Etna, Sicily's grandstand city of Catania fades away but still radiates." Financial Times How to Spend It features villa Don Arcangelo all'Olmo, Sicily, in its article for winter holiday destinations. They say Puglia is the new Tuscany. It isn't. Ethereal, haunting and strange, this region at the heel of Italy is unique, says Stephen Bayley. Auf einem malerischen Hügel an Siziliens Ostküste, zwischen Catania und Taormina, thront die Villa "Rocca delle Tre Contrade“. Jessica Gunn of Waitrose Magazine stays in 'dreamy' Arete in Sicily. Annabel Heseltine discovers Sicily, an island of honey and happiness. Stylist editor-in-chief Lisa Smosarski falls for south-east Sicily whilst staying at Casa Luza. Elle's Samuel Muston embarks on an Aegean odyssey of the Sporades islands. This month Elle UK explores Rocca delle Tre Contrade with it's amazing pool, lava floors and 'life-enhancing views'. 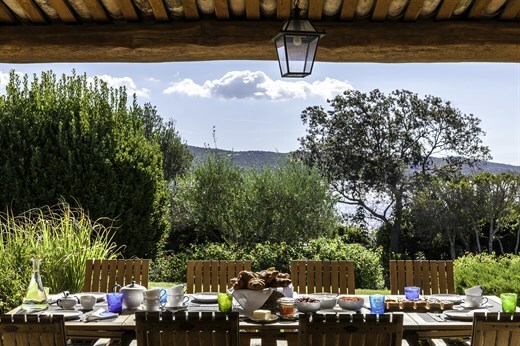 Jo Ellison, fashion editor for the Financial Times travels to Corsica, describing her stay in villa Tamaricciu. The Evening Standard discovers Oscar and Sue Tymon journey to build the perfect villa on Meganissi. Jennifer Goulding visits Rocca delle Tre Contrade to discover how the owners transformed a beautiful ruined house into an idyllic holiday home. Jack Lefley of the Evening Standard discovers the beautiful simplicity of Il Cappero. Mick Hume discovers Skopelos whilst staying at the magnificent Maistros. Reise Aktuell online features Al Jafar, describing the villa's origins, unique features and service options available. Travel writer and cookbook author Ted Lee heads to Sicily to live (and shop) like the locals and cook in Masseria d'Estia. 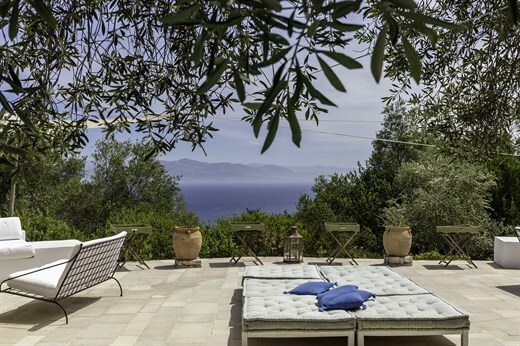 BA Highlife includes Casa Vera in Sicily from The Thinking Traveller in their article for the world's best villas. World Travel Magazine featuring Villa Elia, Trulli Andrea and Melitini. Giles Coren, restaurant critic for The Times, heads to Sicily to discover the local food whilst staying in The Thinking Traveller's villa, Casa Agave. 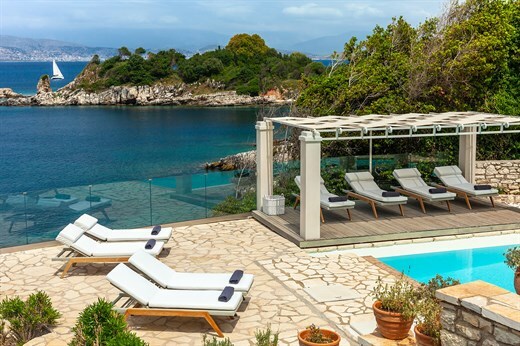 The Thinking Traveller's Think Exquisite villa Penio, on the Ionian Island of Lefkada, features in The Sunday Times piece on Europe’s 50 best villas. Elle Decor features Skye Gyngell's cooking class at Rocca delle Tre Contrade in its Escape section. 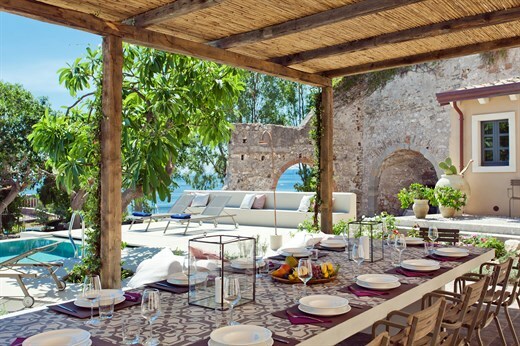 In her piece in the Times on the 50 best holidays in Italy, Annabelle Thorpe chooses the Skye Gyngell cooking class at Rocca delle Tre Contrade, in Sicily. Trulli Andrea in Puglia features in Harper's Bazaar World's Greatest Hotels of January 2017. 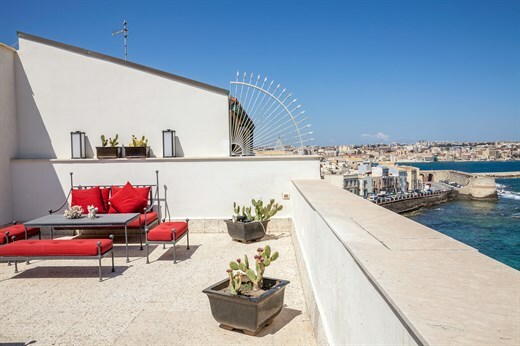 This well-equipped family apartment with panoramic roof terrace occupies the top two floors of a seafront townhouse. The article traces the history of the villa, praising its stunning location and views, and ends by describing the amazing staff and service. A place of legend and lore, Italy's famous island is much more than the Corleones. History, wine and cuisine set the stage in Sicily. Gemeinsam speisen und feiern in ausgefallenem Ambiente. Olive Magazine features Skye Gyngell's cookery class at Rocca delle Tre Contrade in its December 2016 issue. 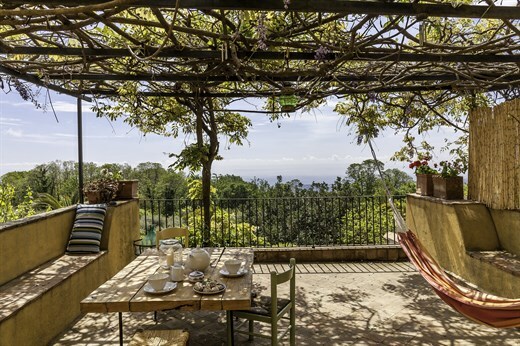 In 1817, the German writer Goethe raved about Sicily in his book Italian Journey: "To have seen Italy without having seen Sicily is not to have seen Italy"
Da gibt's schlechtere Ferienaussichten: Blick von der Villa "Maistros" auf das Ägäische Meer. The Italian architect Luca Zanaroli describes the features of the modern and innovative Montaltini's house. 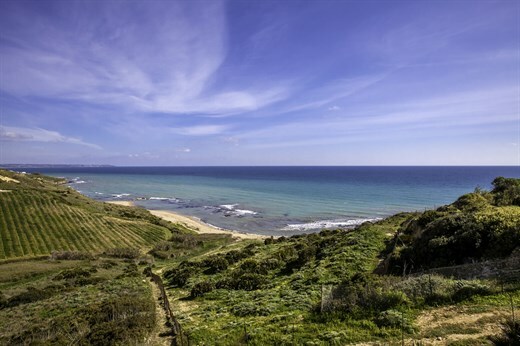 Helen Baron discovers family-friendly luxury in the Sicilian countryside. The island of Sicily has plenty of its own charm (and granitas), but it's really all about the volcano. Travel and food writer Tarajia Morrell writes about her recent stay at La Favorita. L'architetto Luca Zanaroli rilegge in chiave contemporanea la tradizionale corte rurale per disegnare un nuovo spazio architettonico. Paradies unter Palmen: In der "Villa Priscilla" erlebt man Ferienfreude auf Sizilianisch. Circondata da agrumi e arbusti a fiore bianco e blu, si trova a 4 metri dall'abitazione per creare giochi e rimandi di luce, di giorno e di notte. The largest island in the Mediterranean, Sicily has it all - from Doric temples and Ancient Greek theatres to stunning views of Mount Etna. In Sicilia, una dimora dell'ottocento. Gentile e riservata, come la coppia aristocratica che ora la abita. London chef Skye Gyngell gathers friends at a Mediterranean villa for simple seafood, wine from Etna, and an Italian menu you'll want for your own parties. I slept in one of Don Arcangelo all'Olmo's bedrooms, floating as if in a dream between Mount Etna and the Ionian Sea. Whether you want to live like a local for a week or you're traveling with a brood, some trips require an actual home away from home. Un nome mitologico: Estia era la divinità greca protettrice della casa e del focolare. Die Salento Halbinsel bildet den Absatz Italiens, hier liegt die Region Apuliens. Want space? Freedom? Five-star style at three-star prices? A villa can deliver all this. Diese spektakulär gestaltete Ferienvilla nahe Noto auf Sizilien lässt seine Gäste die Schönheit der Landschaft fast vergessen. Chillen im Süden - The Thinking Traveller bietet 180 Villen an. Un tesoro di nome "scoglio niuru"
"Die meisten Leute planen ihre Ferien besser als ihr Leben"
When you want a backyard wedding and don't have a backyard, here's where to go. The Thinking Traveller has expanded its reach to the Greek Sporades islands. Best villas in Italy for special occasions. Die "The Thinking Traveller"-Familie, die exklusive Anwesen in atemberaubender Lage vermietet, hat Zuwachs bekommen: die Villa Casa Vera in Sizilien. Ein Ort, an dem Flamingos und Meeresschildkröten regelmäßig einkehren, kann niemals eine schlechte Wahl sein. ELLE DECOR Italia dedicates a 12-page article to Casa Vera. Urlaubsziel Sizilien? Begleiten Sie AD auf die größte Insel Italiens in die "Masseria d'Estia", eine honigfarbene Ferienvilla, die glücklich macht. Lauren Romano explores the rustic charms of western Sicily, complete with hot-tempered drivers, rugged coastline and exquisite cuisine. Whether atop a craggy Capriote cliff or amid the vineyards, an Italian villa vacation is on the bucket list of just about every traveller. The Thinking Traveller hat ein neues, attraktives Ferienhaus zum Mieten im Programm: die Casa Vera. If you are looking to celebrate your engagement, intimate wedding, honeymoon, or just a romantic getaway, think Puglia. Paxos is tiny but its big heart and laid-back vibe will win you over. A barefooted art student carrying watercolours in a weathered leather bag smokes on a bench in the piazza. Discover the story of Giovanni and Lucia Guarini who inherited a "castle filled with battle weapons, dusty heirlooms and family portraits" and turned it into a luxury vacation rental home. Featuring villa Ortensia in Sicily. Eine gemeinsame Ferienzeit mit der Familie und/oder Freunden wünschen und planen etliche Urlauber. Inside, the expansive living spaces serve as a makeshift gallery for a magnificent art collection. 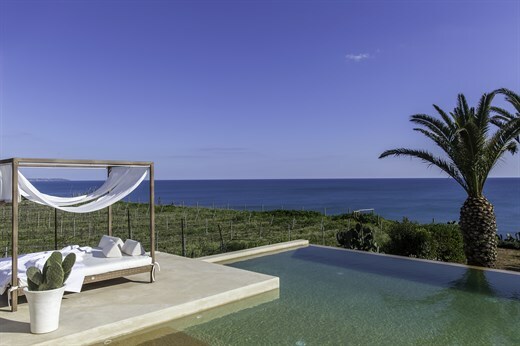 Features Masseria Costanza and Villa San Tommaso as exclusive luxury villas to enjoy la dolce vita in Southern Italy. Amy Laughinghouse discovers the delights of Puglia and in particular the towns of Alberobello, Ostuni, Lecce and Gallipoli. 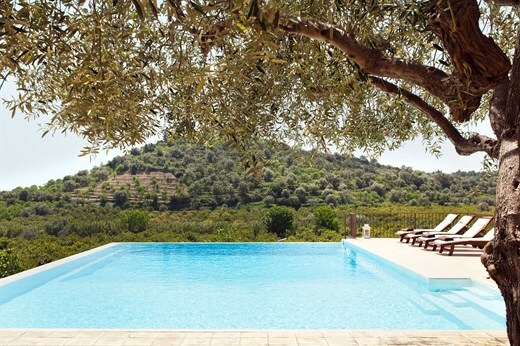 The article evokes how, when staying at Masseria Costanza , one wakes up amongst the lemon groves of the Vendicari Nature Reserve. 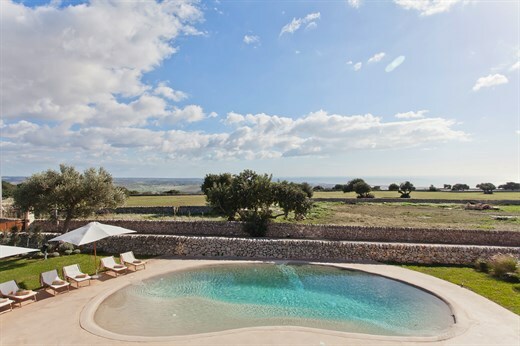 The article features Villa Elia and Masseria Lamacoppa as best places to stay in Puglia. No need to fly to the tropics to enjoy such an incredible view on the sea and exotic green. Guests staying in the most beautiful holiday villa in Sicily can enjoy it from their terrace. 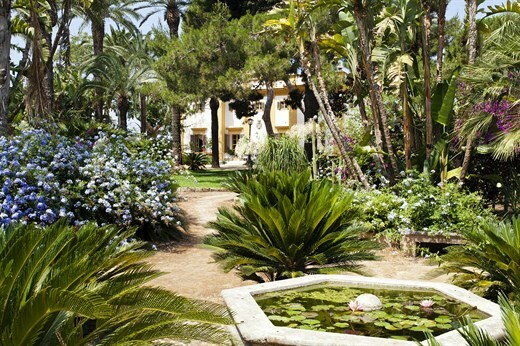 Article features Sicilian villa Al Jafar. "Highlights include the exquisite internal courtyard, the vaulted dining room, the library and the spiral staircase." 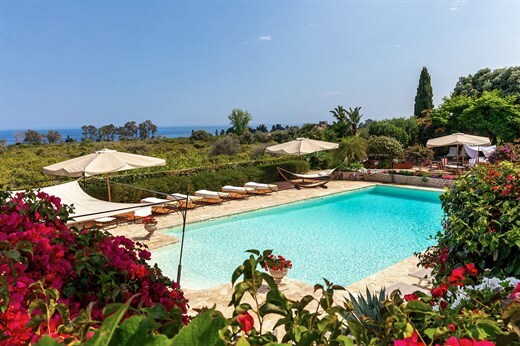 The article features villas Il Canneto and Il Palmento dei Castagni in Sicily and why it is a great destination for families. Though it has been newly built from scratch, this tranquil, unobtrusive and simply furnished rural hideaway in Sicily, I Lentischi, looks as though it could have been here for hundreds of years. In this extensive article, the unique character of Puglia's Villa Elia is described and illustrated by beautiful photography. City Life Magazine photographer Jesse Milns embarks on a five-day adventure with The Thinking Traveller for a picture-perfect getaway along the heel of Italy's boot. The article describes The Thinking Traveller's villas as top-accommodation. Features Daphne in Corfu, Il Gelso in Puglia and Crossing The Rock in Sicily. You can get wonderfully absorbed in a book on one of the many terraces or in the elegant lounge that is furnished with antiques. 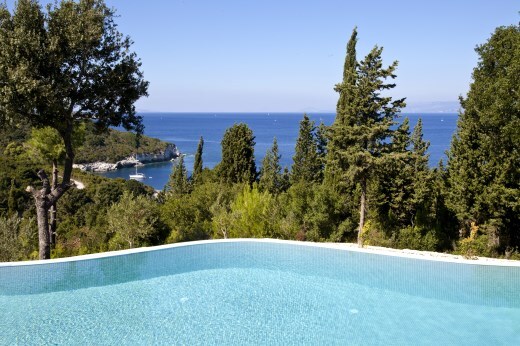 The article features the Ionian Islands and encourages readers to stay in a villa. "Stay in a villa - the feel of a home will make a family trip more comfortable and intimate." The article features Casa Romigi , a charming and recently restored trullo with its own pool in the olive-tree-carpeted landscape of the Valle d'Itria, in the under-the-radar destination of Puglia. 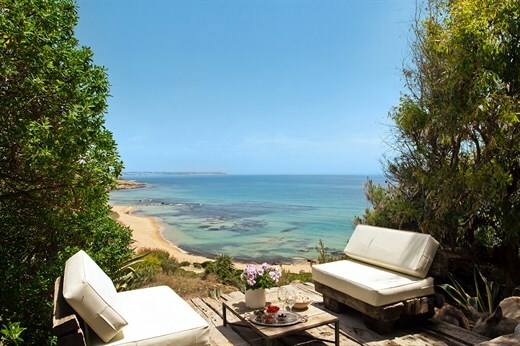 A boutique collection of exclusive villas in Sicily, Puglia and the Ionian islands of Greece. 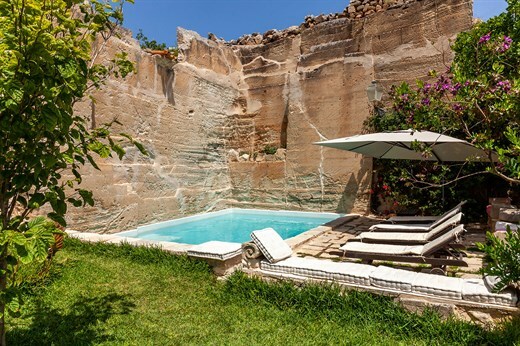 Zu Nillu on Favignana, perched above its own labyrinthine Roman quarry, into which a beautiful pool and a Mediterranean garden has been inserted. 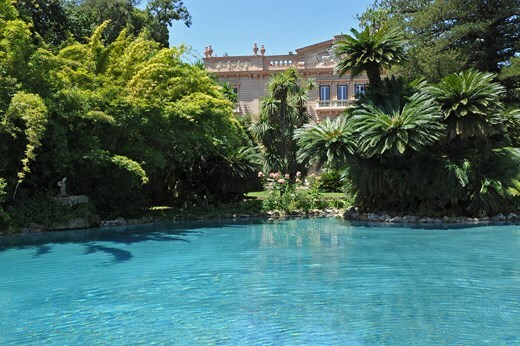 The article features Sicilian villa La Limonaia. "Villa La Limonaia sits at the end of a narrow road bordered by lemon groves..."
Bosco degli Ulivi, this stylishly designed villa... made all the more desirable as it doesn't have the heavyweight price tag that usually accompanies smarter escapes. The article features La Limonaia and our in-villa cook experience. "The magic of Villa Elia starts to embrace you immediately and daily life and your routine blurs into a dreamscape." 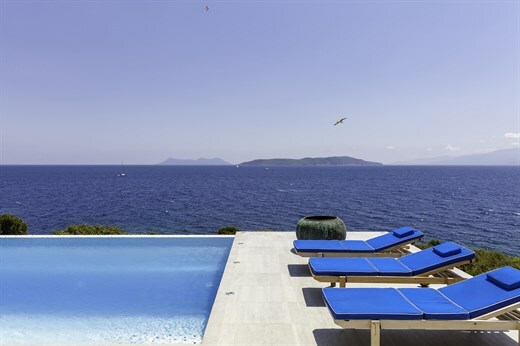 The Independent features villa Kastanida in the Ionian Islands and its dreamy sea views. La Favorita, offers accommodation complete with a personal chef who'll whiz up traditional home-cooked dishes such as fish couscous and cassata Siciliana. 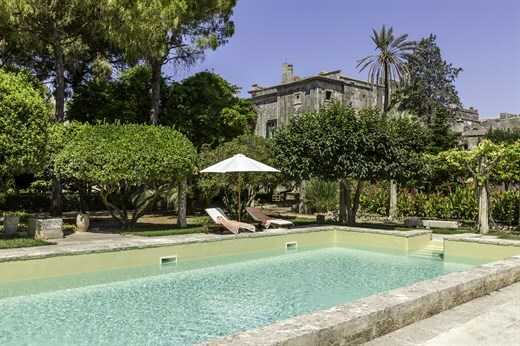 "The Thinking Traveller has very deep roots in Sicilian villas that are reflected in their Think Sicily properties..." Travel Pulse features Villa San Tommaso. 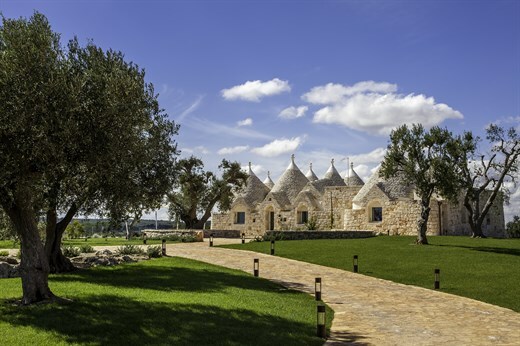 Trullo Rosmarino is a beautiful example of how traditional trulli that dot the landscape can be incorporated into modern homes. 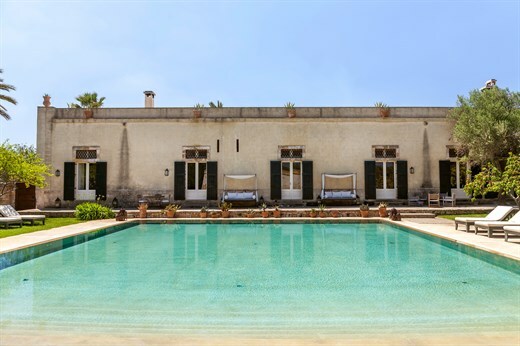 Featuring Masseria Scippm, its Puglian features and its superb private pool. 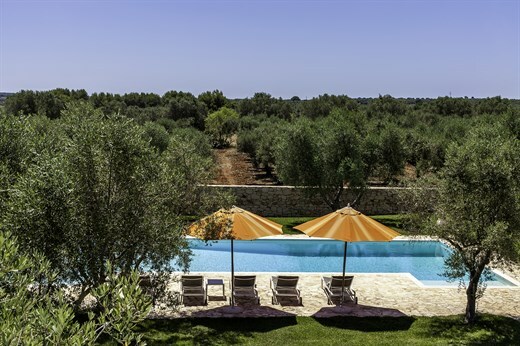 Featuring five of The Thinking Traveller's villas in Puglia: Discover bosco Marti, L'Argentiera, Masseria Scippi, Trullo Pinnacolo and Villa Blanca. Kastanida has a chic lap pool and a shady courtyard ridged by cushioned benches. 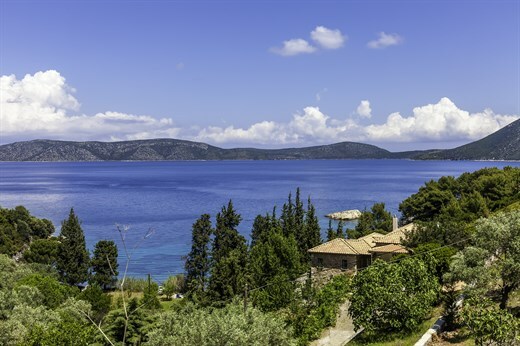 Outside, it's fringed by woods with dramatic sea views over nearby Lakka. 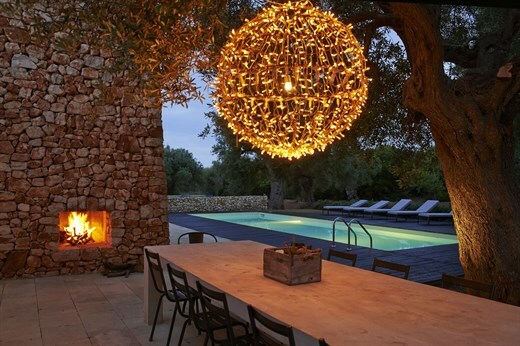 Trullo Pinnacolo is the work of Parisian architect and interior designer Fabrice Bejjani. 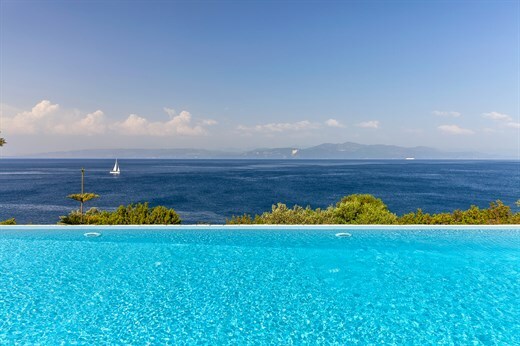 Located just south of the historic resort town of Syracuse, the villa L'Olivastro with its panoramic views makes the Mediterranean the star. The Financial Times features The Thinking Traveller's villa Casa Nuvola and cooking classes in Palermo. The Dutch magazinefeatures Puglia's stunning Palazzo Gorgoni, a truly aristocratic townhouse with pool and rooftop terrace. Featuring new destinations and new villas from The Thinking Traveller. 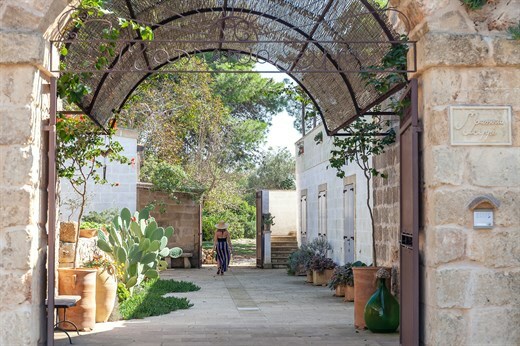 "Pushing open the glass doors of Trullo Gaura I was hit by the soothing aroma of warm lavender before taking in the wild flowers of the garden..."
The Noreweigan magazine dedicates a seven-page feature to Think Sicily's villa Rocca delle Tre Contrade. Die Villa Olmo in Siziliens Osten ist ein Traum in Altrosa und Gelb. Das Schöne daran: Der Traum kann Ihnen gehören, für eine Woche, zwei oder drei. "Bosco degli Ulivi is tucked two miles inland, nearly at the tip of the peninsula. (...) As its name suggests, it lies in an olive grove." Madame Figaro features Rocca delle Tre Contrade in its Travel Notebook as a desirable villa for a stylish holiday in Sicily. Featuring Christina on the island of Meganissi. The writer describes his stay in the modern villa that overlooks the port of Vathi. Catherine Ostler writes about her week at Sicilian villa Corte del Sole, a beautiful converted farm building. Featuring Le Corti di Cannamara - "This converted farmhouse has seven bedrooms, plenty of outdoor lounging and dining space..."
Design magazine Wallpaper Online features Masseria Costanza in Sicily, set in the Vendicari Nature Reserve. The article features CaSale and Julia Rotherbl as she discovers the advantages the house brings for a group of friends travelling together. Sarah Randell meets Donna Marina, owner of Don Arcangelo all'Olmo who teaches her how to make arancini. Read about her experience. Four Magazine mentions two 'Think Experiences' from The Thinking Traveller in its list of the best summer cookery schools. Where are the world's best villas? 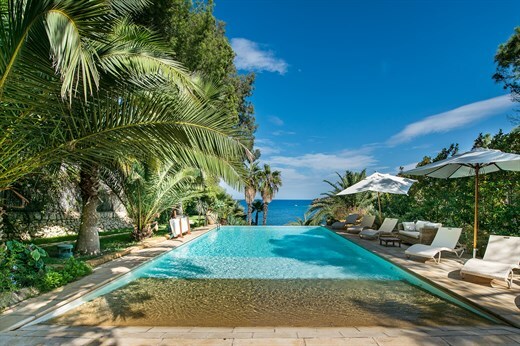 Zu Nillu is now a stunning seaside villa, built into a disused Roman tufa quarry that has been impressively transformed into a sunken garden and swimming pool. Baia dei Turchi has fantastic sea views and exotic green surroundings. Enjoy all this from your own terrace as a guest at Sicily's most beautiful holiday villa. 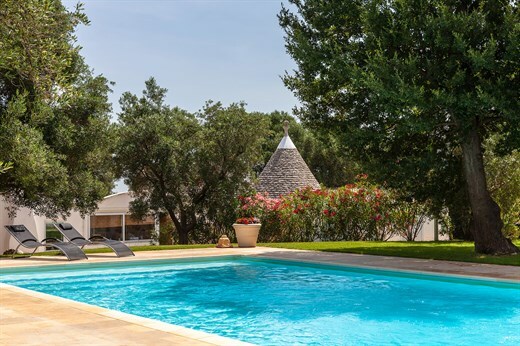 Madame Germany invites readers to discover...Trullo Melograno, complete with seven trulli cones set in beautiful gardens with a generously-proportioned pool. 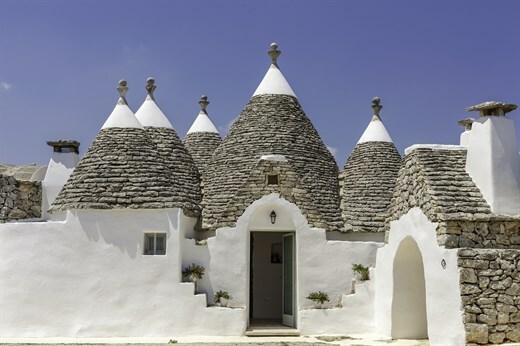 Architectural Digest chooses Trullo Melograno as its prime example of a trullo, an architectural phenomenon unique to the region of Puglia. The Times Travel features Casa delle Sirene in its round-up of 50 secret Mediterranean beaches. The luxury coastal lifestyle magazine features Villa Elia, Villa Blanca, Masseria Curti Vecchi and Palazzo Gorgoni. Also includes our exclusive Think Experiences. Country Life Magazine recommends The Thinking Traveller's itineraries and Think Experiences for children. Puglia is a hot destination for 2014. 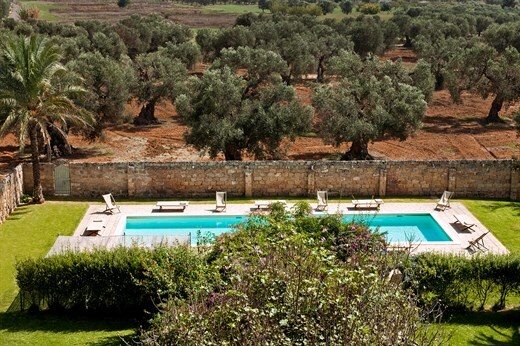 And the best places to stay are the masserias, or converted farmhouses. The writer of the article describes her experience at The Thinking Traveller's Trullo Pinnacolo in Puglia. 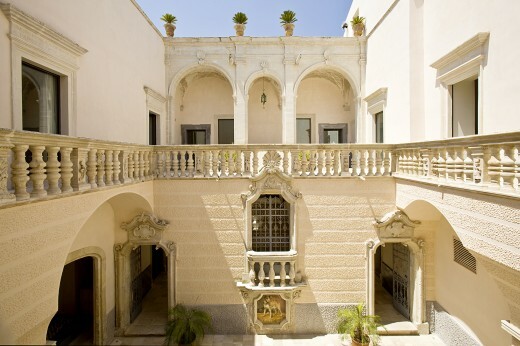 Journalist Andreas Tölke follows quite literally in the footsteps of Richard Wagner, taking a pilgrimage to the 18th century Villa Tasca in Palermo. Part of Condé Nast Traveller's villa feature, Casa Nuvola boasts spectacular views from its huge pool terrace and alfresco dining area. 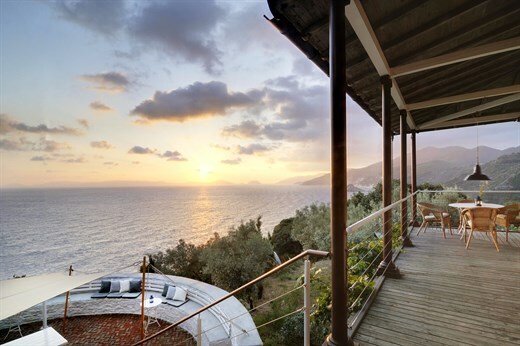 Country & Town House features villa specialists The Thinking Traveller and Villa Elia. 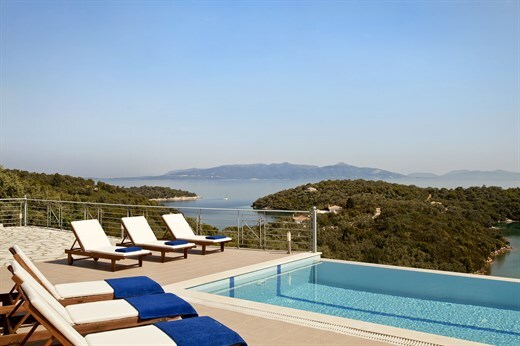 Coverage on The Thinking Traveller's new villas and destinations including Corfu, Paxos and Antipaxos. 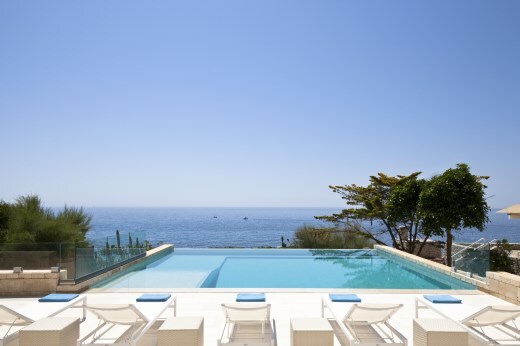 The Times list of best villas in the med features Casa delle Sirene in Sicily. 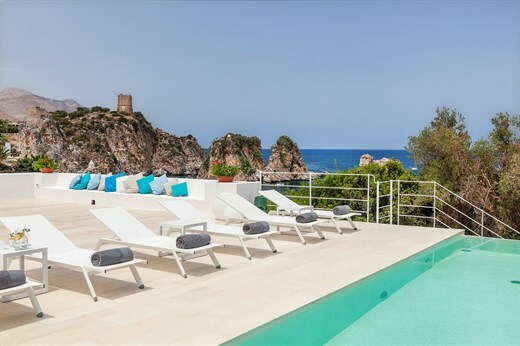 The Times list of best villas in the med features Acquamarina in Sicily. The Daily Telegraph's names the Egadi islands off Sicily's west coast as one of twenty destinations for 2014. Stay with The Thinking Traveller. 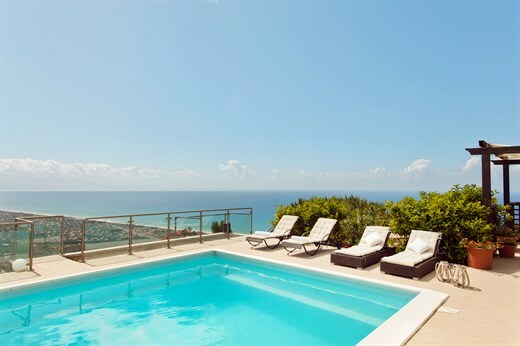 Featuring Think Sicily amongst its list of the best villa rental agencies. Photographer Jon Whittle discovers Sicily and Don Arcangelo all'Olmo in Islands Magazine. 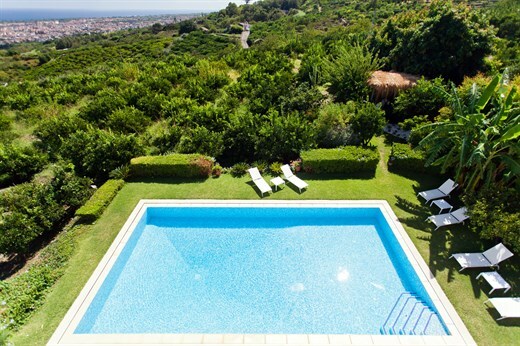 Cinnamon in Sicily is placed at number two for seaside escapes in the Sunday Times 50 best villas. Renowned photographer Jon Whittle takes the breath-taking Egadi Islands as his subject, featuring nine photographs of beautiful Think Sicily villa Corte del Sole. Discover Southern Sicily with this article from the Daily Herald online. Features Think Sicily villa Gioi. French Vogue online magazine presents Mount Etna as the perfect winter destination. Features Think Sicily. ‘Styles’ magazine, a supplement of French publication ‘L’Express’, features Villa Tasca in its round up of the most desirable places to spend New Year’s Eve. Features The Thinking Traveller's new destinations: Corfu, Paxos and Antipaxos . 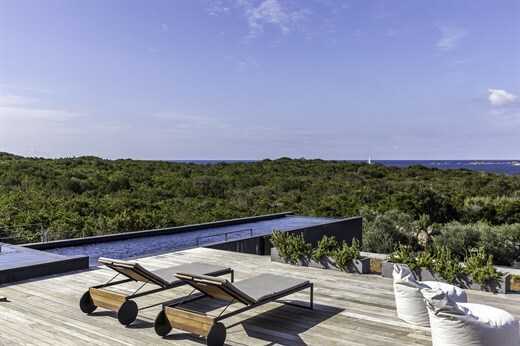 German-language online magazine praises villa Palazzo Hedoné for its exceptional architecture, offering a perfect fusion of modernity and history. "Don Arcangelo all'Olmo is, in a word, magnificent. 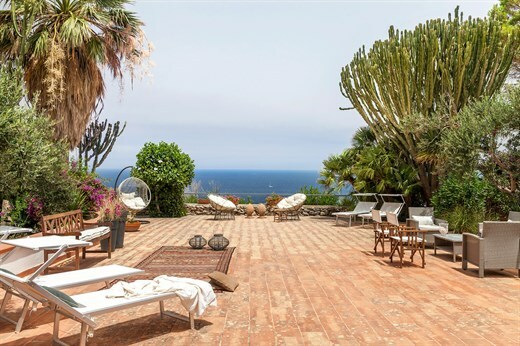 Villa l'Olmo (as it's affectionately called by insiders) is the most lavish villa for rent in all of Sicily. 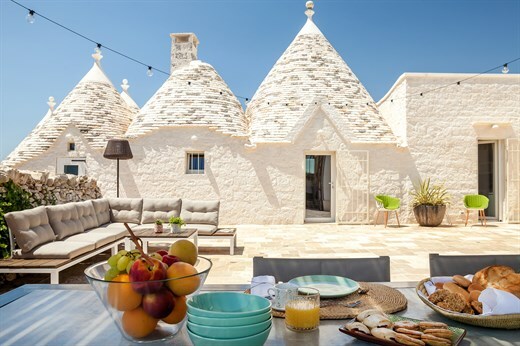 "Trullo Pinnacolo, designed by Parisian architect Fabrice Bejjani, conceals a stylish and generously-proportioned holiday home beneath its rustic facade." 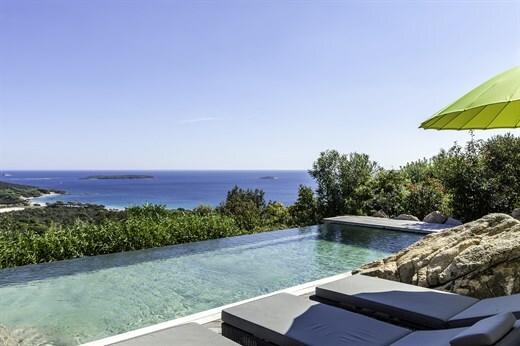 Article features villas Casa Carcicera and Crossing the Rock, in the best villas in which to spend a winter holiday with family and friends. The online article features a review of Le Corti Di Cannamara. "With light-coloured stone floors and walls, and shady, sunlight-dappled outdoor living areas all around, this is the summer house of one’s dreams." 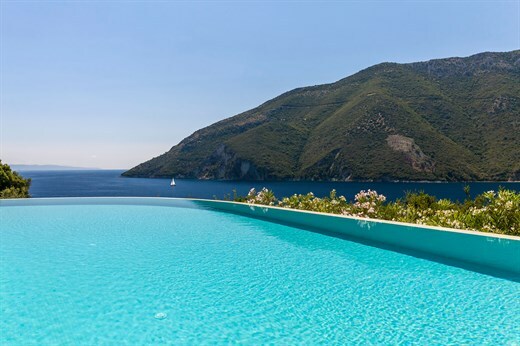 Article features Don Arcangelo all'Olmo, Rocca delle Tre Contrade and Cubo al Mare, three of the most luxurious villas on offer from The Thinking Traveller. 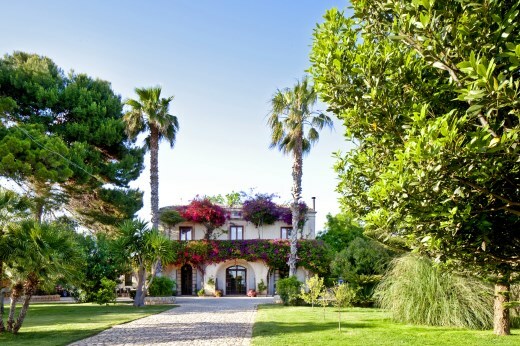 Article features Villa Tasca. "Die Palmenallee als Auffahrt gibt einen ersten Eindruck der Villa Tasca nahe Palermo." Featuring Villa Farli in Baby London magazine's collection of the finest stays across Britain and further afield. Cape Lougi on the island of Lefkada features in Austrian publication "Wellness Magazin". "Casa alla Scala offers the perfect mix of relaxation with a window on to Sicilian life – breakfast on the terrace and watch the busy fishermen below." Stylist’s Lisa Smosarski avoids the tourist track and discovers idyllic, untouched beaches and a surprising foodie hot-spot. 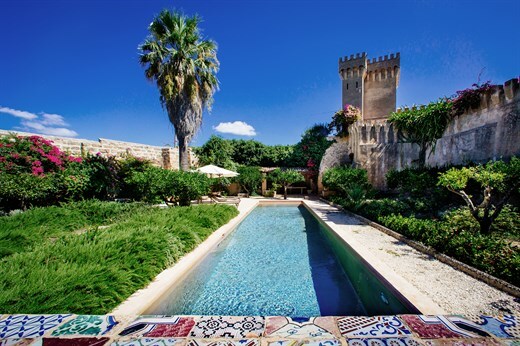 Rocca delle Tre Contrade in Sicily and Villa Elia in Puglia feature in Canadian online magazine, The Loop, as two of the top celebrity romantic getaway hotspots. In the Italian newspaper's series of interior design supplements, I Lentischi receives a five-page feature as a shining example of impeccable design. Embracing the sweet life in Southern Italy. Featuring the Think Exquisite Villa Elia. 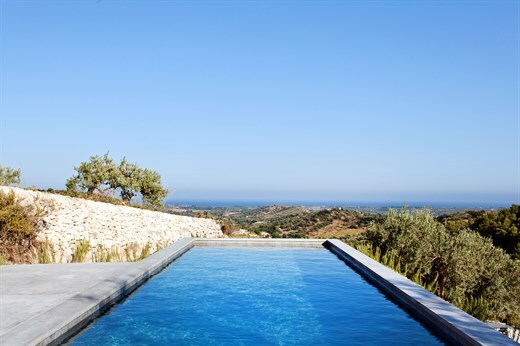 "The Thinking Traveller, known for their luxury holiday homes, are unveiling five new villas in Sicily and Puglia, Italy"
"The infinity pool at the recently restored Rocca delle Tre Contrade...overlooks the Ionian Sea and vineyard in the foothills of Mount Etna." 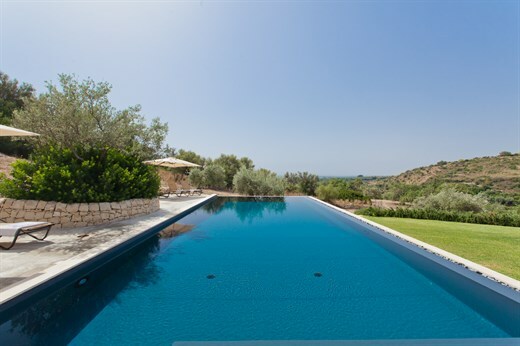 Featuring "Le Corti di Cannamara, a seven bedroom renovated private luxury farmhouse with pool, near the town of Modica in Southwest Sicily." Austrian magazine Onrail features Villa Tasca. "The Brides fashion team check into a historic palazzo reborn as a private villa." 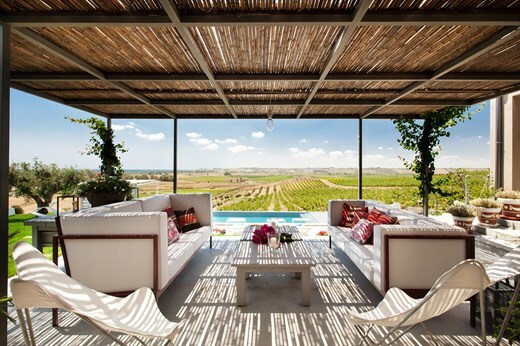 Featuring The Thinking Traveller's new villas in Sicily and Puglia. 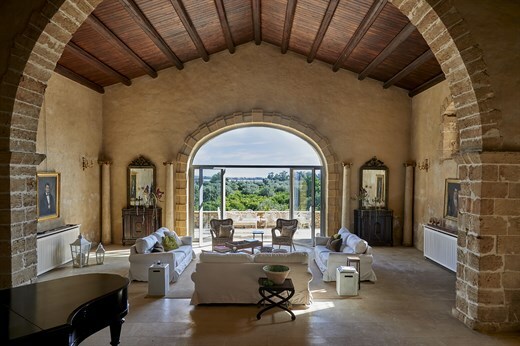 "Located on the eastern coast... Don Arcangelo all'Olmo is considered a highlight in the portfolio of Think Sicily and the most beautiful holiday home in Sicily." The article features Sicily's incredible cuisine and Think Sicily villas Oliva and Pietra Nera. Yahoo! Travel lists Sicily as one of their six destinations to visit before baby arrives. Villa Tasca features in Wellness Magazin. "Bazaar discovers the most beautiful secret gardens in the Italian countryside." 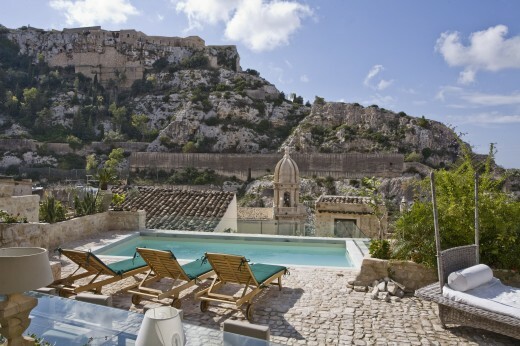 Think Sicily villa Aphrodite features in French magazine 'Sport & Style'. House and Garden Magazine features our Think Experiences for children in Sicily, including creative workshops. "Under the bright blue skies of Italy's Pantelleria island, Anthony Capella discovers a foodie paradise." Angels and Urchins features Think Sicily in their travel directory for 2013. 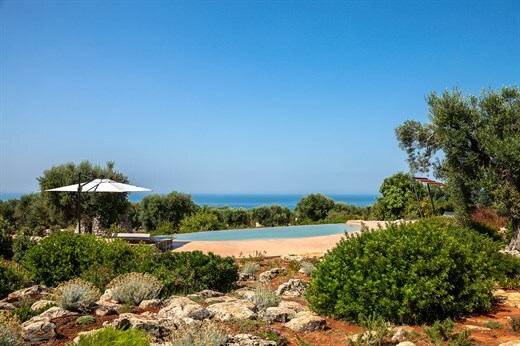 "Think Puglia specialises in the area’s most desirable villas, and Villa Elia can accommodate up to ten (17 in reality, ed.) guests..."
Palazzo Gorgoni features in the April edition of Architectural Digest. Ian Walker and family discovered that a luxury villa in Sicily was the best way to savour the island’s exceptional cuisine and culture. 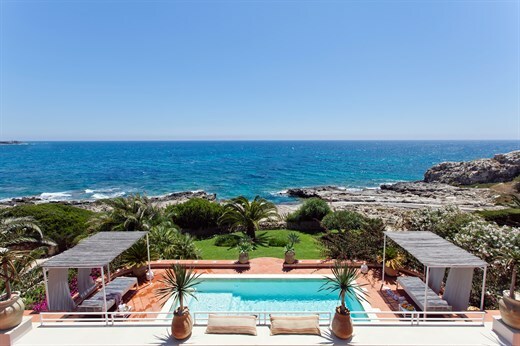 Article features Villa Tasca and The Thinking Traveller's Think Experiences, including cookery classes. "Think Sicily propose à la location un grand choix d'adresses haut de gamme, remarquables par leur situation et les services offerts." "Think Sicily suggests Trulli della Mirandola in Cisternino, set in a garden of fig and olive trees and close to the towns of the Valle d'Itria..."
John Kampfner stays at Il Trullino and tries out our cookery experience with Anna Maria Chirone. "Think Sicily offers a week at Villa Tasca sleeping up to eight... and a full-day cooking course with the Duchess of Palma..."
Trullo del Sale features in the April edition of German magazine Golf Journal. Condé Nast features Crossing The Rock in their villa guide 2013. Travel & Leisure magazine feature Think Sicily as one of the best villa agencies in the world. "Rocca delle Tre Contrade delivers an all-out assault on the senses." Read why Food and Travel calls the villa the perfect palazzo. 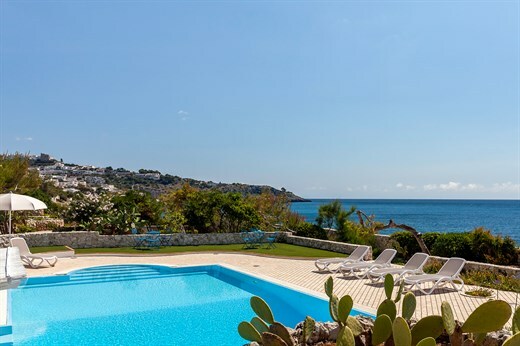 Features Think Sicily and its portfolio of villas, comprising Baroque palaces, country houses, seafront villas and houses with breathtaking views. The definitive collection of Italian villas from Nuvo Magazine. 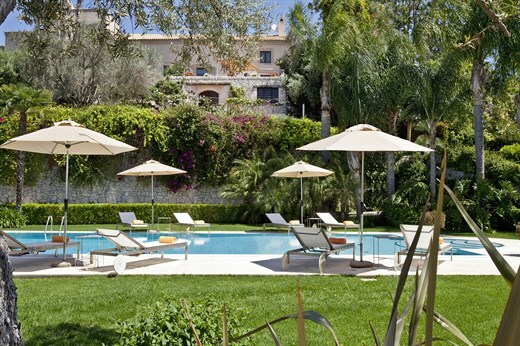 Brian Viner from the Financial Times describes his stay at Villa Tasca. 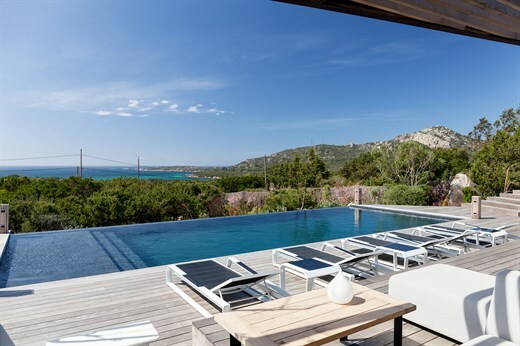 "We could not have had a better base than Villa Tasca..."
Villa Acquamarina places in the Sunday Times 50 sensational villas list. With its outdoor kitchen and dining area, at Casa di Pietra the chef needn't miss a second of those long, al fresco lunches. "Rosa Marina is ideal for a stress-free family holiday: it's an immensely stylish bungalow sleeping six in three en suite bedrooms." "Perched above a Roman stone quarry, into which a pool and a Mediterranean garden have been inserted, Zu Nillu looks like a futuristic film set." We wanted to narrow the search for the perfect self-catering property. So Robery Ryan asked the rental company bosses where they'd book. In this special edition on the Mediterranean, Sicily featured prominently and Think Sicily's villas took a starring role where accommodation was concerned. In the October 2012 issue of Elle Decor Italia, 10 pages were dedicated to our lovely Secondo Amore. Bosco degli Ulivi featured in Case & Country magazine. In September 2012, OK! Magazine published a two-page spread on Puglia... Think Puglia took the starring role! "On the edge of the beautiful medieval hill-town of Specchia, Villa Specchia sits in its own walled garden, which is bigger than our local park." 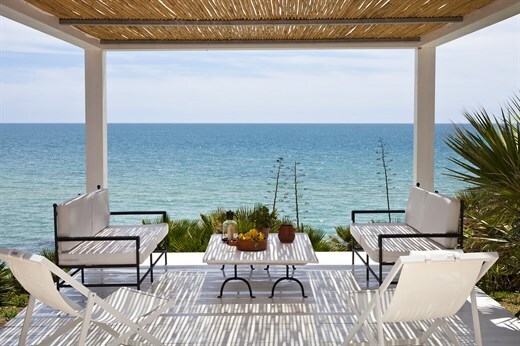 Think Puglia had two properties featured in an end of summer feature in The Independent i. 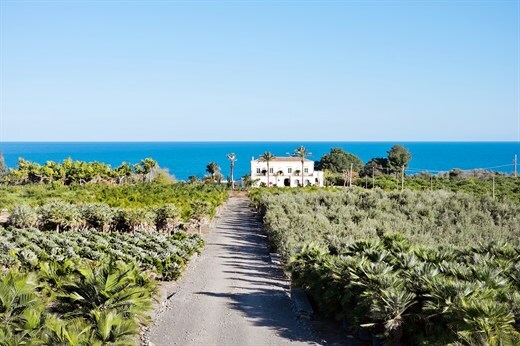 "A long avenue of palms leads to Villa Tasca, Palermo's largest and most private residence, within a four-hectare garden..."
In 2002, Huw Beaugié and his Sicilian wife, Rossella, gave up their careers to start Think Sicily, a high-end villa-rental specialist. "Forget seaside villas - this summer the cognoscenti are renting 'masserie'or fortified farmhouses, in Salento, an unspoiled southern Italian region..."
Zu Nillu, our fantastic villa on Favignana, featured in The Guardian. 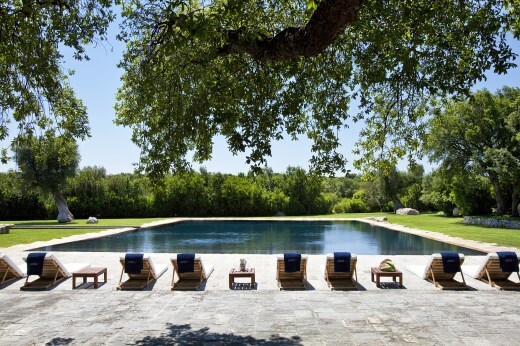 Think Puglia is featured in Harper's Bazaar's round up of the best private villa experts. "Another good long-stay apartment in Ortigia is Archimede, a sea-front property with a panoramic terrace, which is rented out by...specialist Think Sicily"
"Villa Mirabella is surrounded by olive groves and fruit trees and has an amazing 'beach-style' swimming pool..."
The October 2011 issue of Harper's Bazaar featured Palazzo Hedoné in Sicily. Casa delle Sirene chosen by BA High Life as one of the 25 best island holidays in the Med. Villa Elia received a 10-page spread in Italy's July 2011 edition of the presitigious international magazine, Architectural Digest. An expert's guide to Sicily in The Daily Telegraph featuring Think Sicily. The best bit: Watching the sun rise from the sea-facing terrace. "The Infiorata sees local artists carpet the Via Nicolaci with a mosaic of flower petals, in a labour of that has to be seen (and smelt) to be believed." "Villa Blanca: It's perfect if you want to host the pool party of the year. 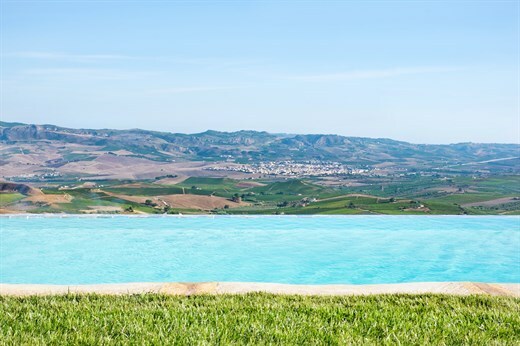 the infinity pool is stunning, with a Jacuzzi corner..."
"This poshed-up Sicilian farmhouse is massive... and has bags of country charm." 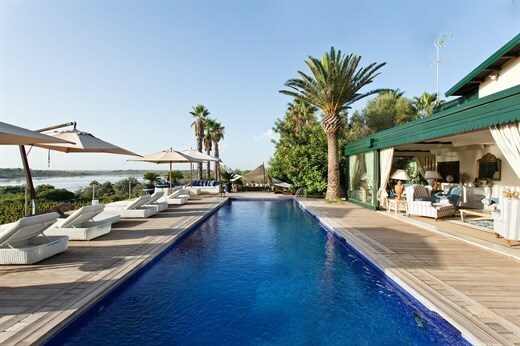 Inland villas paired with glamorous Mediterranean beach clubs offer savvy holidaymakers the best of both worlds, says Sophy Roberts. "This stately, 18th-century villa with beautiful rural views has a vast garden of lawns, groves, fruit tree and a walled pool with showers and a gazebo." September 2017 The Sunday Telegraph They say Puglia is the new Tuscany. It isn't. June 2017 MilK Decoration Havre monacal. June 2016 Niche-Beauty Ciao Apuglia! May 2016 Ville & Casali Un tesoro di nome "scoglio niuru"
April 2016 DECO Home Was darf's sein? June 2014 Cosmopolitan Germany Sizilien - o sole mio! May 2014 BA Highlife Where are the world's best villas? April 2014 Architectural Digest Tri, Tra, Trulli! March 2014 Country & Town House Who You Gonna Call?